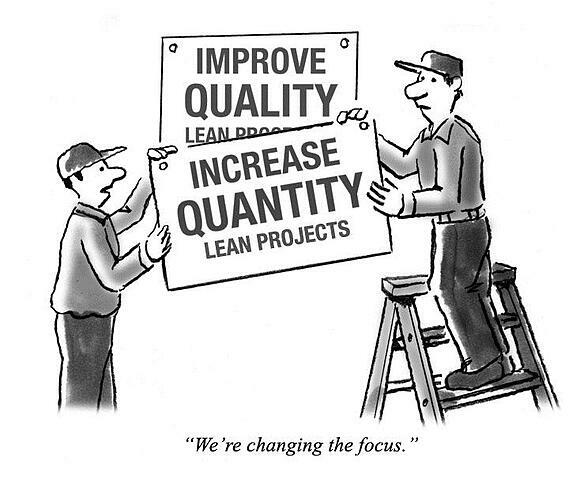 Many lean quality improvement programs are not lean. It may be politically incorrect for a logistician go after logistics quality programs that seek only to eliminate inefficiency, but the time has come. Lean may have started as a grassroots effort to cut waste and improve quality, but over the years lean programs have become institutionalized, with all the accompanying bureaucracy -- meetings, budgets, paperwork and reporting. Here's an example of a nasty by-product of this evolution. Because lean logistics programs come with a cost, certain executives are obligated to show an ROI. As a result, tactical assignments that could be handled with a meeting or a few phone calls get put forward as formal lean projects so someone at some level on some report can attach the cost savings to the lean program. In companies where these kind of things are allowed to happen, the management of lean programs can actually interfere with getting the work done. At KANE, we have made significant investments in lean six sigma training and are focused on running active, but lean, quality programs. We talk more about lean program pitfalls in our paper "How Lean is Lean?" Here are some quick tips to ensure most of your time in lean program implementation is focused on doing the work, not managing the work. Define how lean and Six Sigma programs will work for your organization. Don’t implement a generic version of lean. Adapt the program, as needed, to fit your company’s objectives, structure and culture. Keep the training simple. Overly academic or complicated training can turn off the operations staff, who will ultimately determine the program’s success. Pick the right lean logistics initiatives to develop as formal projects. Many may not require the formality and structure of a Lean project. Keep meetings to a minimum. And keep them short. Manage group sizes. If you’ve got 15-20 people on a project, that’s too many. The more people, the less productive you’ll be. Staff can be involved without being a part of the core team. Define a timeline. Open-ended deadlines invite wasted time and delay closure. Lean out your tool set. Pick just a handful that you’ll use regularly and revolve your training around these. Involve customers. Ultimately, everything you do is designed to drive customer value. Inviting customer input directs your efforts toward the most value-driving activities. Read more about lean logistics program management in our paper "How Lean is Lean?"